New RCMP Commissioner Brenda Lucki appears at a House of Commons Standing Committee on Public Safety and National Security in Ottawa on May 7, 2018. A Liberal MP has apologized after asking the RCMP's first-ever female chief how she will be able to "tell the guys how to behave." Commissioner Brenda Lucki was installed as the national police service's new boss last month. On Monday, the federal government released a mandate letter from Public Safety Minister Ralph Goodale that said it was entrusting her to shape the organization into one that "Canadians see themselves reflected in." 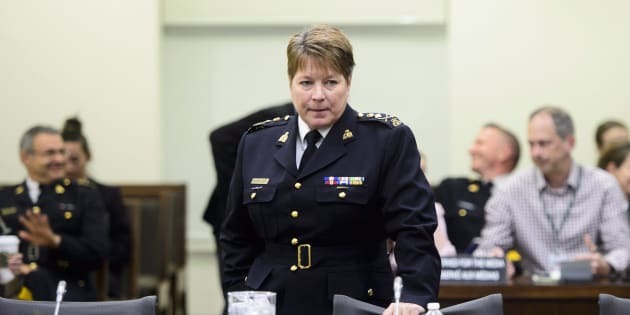 Later in the day, Goodale and Lucki appeared at a House of Commons committee on public safety and national security, where she was asked about issues such as harassment among Mounties. "It's a tough environment," Quebec MP Michel Picard told Lucki, who has been with the RCMP for almost 32 years. "So I would like to hear you about, allow me to say, how will a lady tell the guys how to behave?" "We do it all the time. It's part of our makeup. Ask my husband," Lucki shot back as Picard started laughing. "I think actions speak louder than words, so we can say all we want about harassment but we need to demonstrate that behaviour," Lucki told the committee. "And it comes from the top. If you permit something, you're promoting it. So we have to show that we don't permit those behaviours." After her committee appearance, Lucki held a press conference with Goodale, where reporters asked about Picard's comment. "The fact that we have to identify me by my gender means that we still have some work to do, but I'm okay with it. I'm ready for the work, and I think gender aside I was chosen for what I bring to the table, and I'm ready to make the change in the RCMP," she said, according to CTV News. Later that evening, Picard apologized on Twitter for his remark and said his question to Lucki was not how he "intended to phrase it." Allegations of harassment and bullying have plagued the RCMP for the past several years. In October 2016, Lucki's predecessor Bob Paulson delivered a formal apology to hundreds of former and current Mounties who were subjected to bullying and harassment. "You came to the RCMP wanting to personally contribute to your community and we failed you," Paulson said at the time. "We hurt you. For that, I am truly sorry." Lucki told The Canadian Press the issue of harassment is not "black and white" and noted that she wants to address the root causes of the issue. "I need every employee in the RCMP to own that, and have the courage not only to be accountable for themselves, but to have the courage to be accountable to others, for others, and say, that's unacceptable and take a stand."